Mobile gamers across the globe have been waiting for news about Pokémon GO! As you might be aware, the game is going to be a major release from the developer and both players and stakeholders expect tons for it. However, things have been progressing pretty slowly and Nintendo has also been quite secretive. Apart from a few sneak peeks, nothing much was known about this forthcoming augmented realty adventure! Nevertheless, this year's E3 has provided us with a few hints and these include the possibility of an “end of July” launch. Keep an eye on this blog for more details! The Guardian has finally revealed its latest top 10 iOS games chart and it holds some interesting titles! Leading the way this time, is an app in the name of Warbits. The latter was published on the App Store about a month ago and it now holds a 4.5/5 star rating. When it comes to the gameplay, it's all about turn-based strategy and a pretty original experience awaits. You might want to check the trailer for a better idea of what we mean. Enjoy and remember to consult the full listing on The Guardian's tech section! 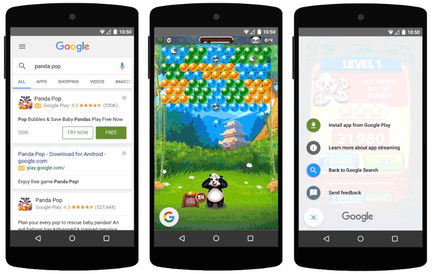 "Search trial runs ads" will allow users to test games in Google search! A brand new feature called “search trial runs ads” has now been announced by Google! The latter will basically allow users to test games within ads that normally show-up in Google search results. Do note that only Android games will benefit for now and Google is likely to reveal more in the future. This new feature will roll out in the coming weeks and it will eventually showcase Android titles in a whole new light. Check your search results soon to test it all out! It is called Slashy Souls and it can now be found on the iOS and Android stores. This new mobile game is from the awesome Bandai Namco and it's an endless running title that will surely thrill. Players will get to control a mighty warrior as he treads across a deadly land. Watch the trailer for an idea of what to expect from this 16-bit piece of entertainment! If you keen to get into some arcade style action, you will be served with Tomb of the Mask! The title is from a mobile game developer in the name of Happymagenta and it will take you back in time. Looking like a cross between Pac-Man and Downwell, this app will certainly deliver! It comes with a pretty fast paced gameplay and you will indeed need to be quick to get away from those who might want you dead! Check your local App Store for more details, it's all free! Guitar Hero Live comes with a $99.99 bundle! The wait is over for Guitar Hero fans worldwide! Activision has finally released the latest version of the game and it's free-to-play on iOS exclusively. The app will deliver both single-player and multiplayer modes and two free trial songs will be offered. However, for more of these, users will be presented with a bundle that will cost a whopping $99.99! A Bluetooth LE six-button guitar controller, guitar strap, redeem code, 2 AA batteries and 40 new tracks will then be accessible. Whether this is value for money, is up to you, players to decide! Remember to watch the trailer for an idea of what to expect! Covering mobile games from major download platforms, Cnet.com is always on time to reveal what's best out there for gamers. The news reporter has now published a top 18 list and it features some of the most popular apps now on the iOS and Android stores. Leading the way this month is a sequel to EightyEight Games' 10000000. The title is called You Must Build a Boat and it's a mix between a match-3 and a dungeon crawling title. 17 other really cool apps follow and you can consult the site for the full listing! For expert opinion about the latest apps and mobile games, The Guardian's weekly charts can surely help! One of its latest listings showcases 10 of the best iOS games on the market right now. Apps listed are of all genres and they indeed are the very best that you can see on the App Store nowadays. Leading the way this week is a free-to-play game called Tiki Taka Soccer. The latter is a football simulator and even though it comes with graphics from the 90s, it still is pretty entertaining and fun to play! Check it out!